2. Cut into medium size pieces. 3. Grind chilli powder, coriander powder, turmeric powder, peppercorns, cumin seeds, aniseeds, cinnamon, cloves and cardamom to a paste. 4. Cook the meat, adding the ground paste and rest of the ingredients. 5. After the meat is tender and coated with a little gravy, remove from fire. 6. Heat oil, splutter mustard seeds, and fry the onion. 7. Stir in the meat and fry well until dry. 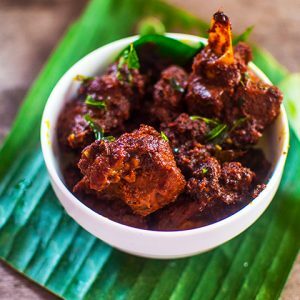 Feel free to comment or share your thoughts on this Meat Oolarthiyathu Recipe from Awesome Cuisine.